Spring Roll Recipe | How to Make Spring Rolls Step by Step. Vegetable spring rolls – are a delicious and extremely popular and easy Chinese snack starter loved by everyone. The yummy veg spring roll is often served at many Indo Chinese restaurants. These rolls, as can be seen, are crisp from outside and have spicy veg stuffing within. At home, we can make these either using homemade spring rolls wrappers or from store bought spring roll sheets too. 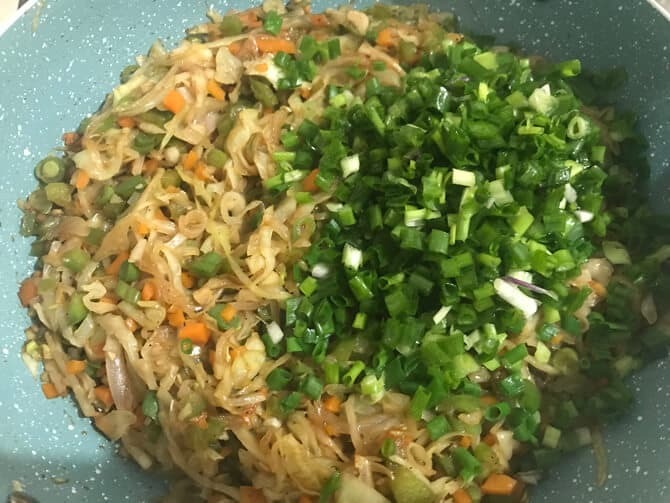 The other variation is to add noodles to make noodles spring roll recipe. Serve these crisp Chinese spring rolls with hot dipping sauce as a snacks for tea time or starters at weekend dinners or parties. 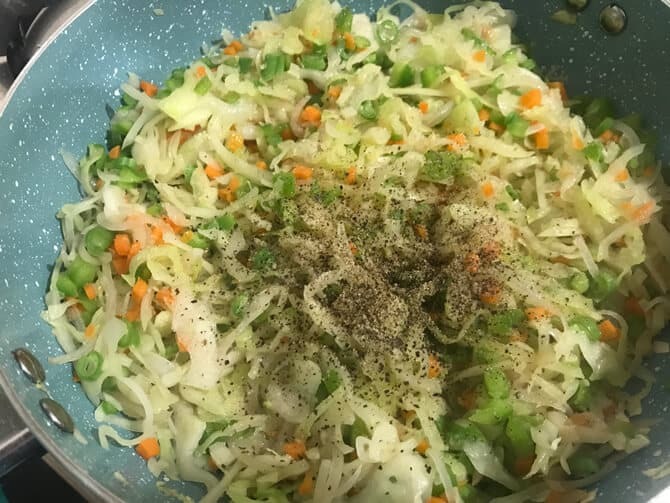 Up on the blog today, is a much awaited vegetable spring rolls recipe, as there were lot of requests to post the recipe here. Truly speaking, making spring rolls at home is not at all a difficult task. 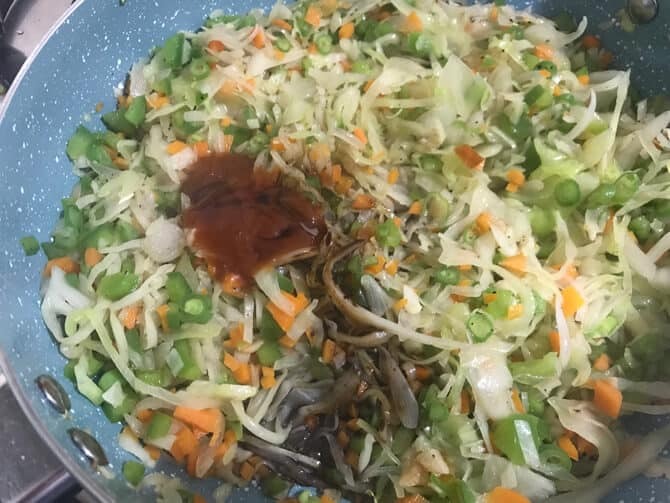 This delicious street food recipe, I am sharing with you all is an extremely easy veg spring roll recipe. Not only these veg spring rolls are our favorite, we love chicken spring roll too, especially my son loves them. Before we proceed further, I want to share some thing to you all my dear readers. Today, my little one did her first Ramadan fast. So, this delicious crisp snack along with her favorite bread roll and aloo tikki is dedicated to her. Yeah, we have already entered the holy month of Ramadan and our fasting has begun. May Almighty bless all of us with HIS mercy and guide us to right path, Ameen! Now, coming back to today’s recipe which is easy and simple, let’s start with some tips on how to make best spring roll recipe at home. Firstly, vegetable spring rolls do not require long list of ingredients. However, it is absolutely one’s choice to add any veggies they like. Secondly, it is very easy recipe to make. 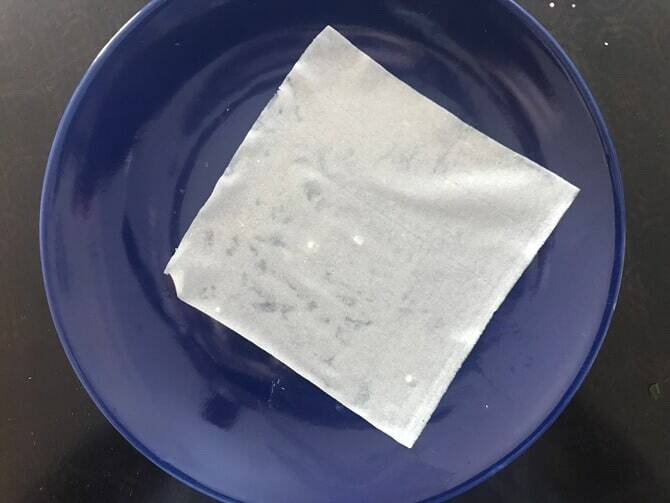 So, an important part of this recipe, the use of wrappers. 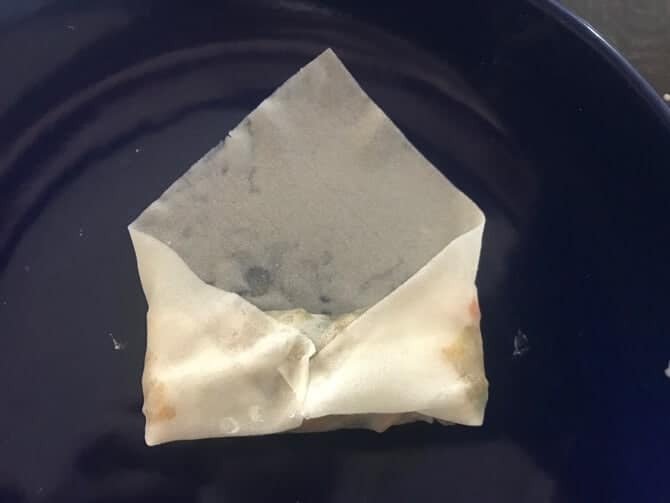 You can use homemade spring roll sheets or store bought too. 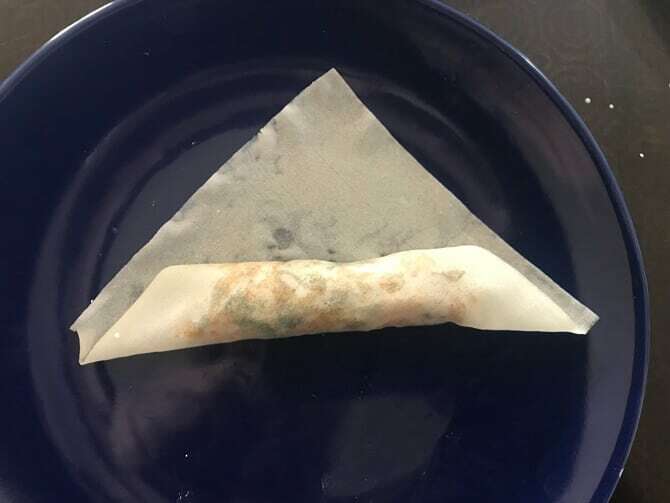 Usually, I use homemade spring roll wrappers, but if in crunch of time, then I use the store bought ones too. 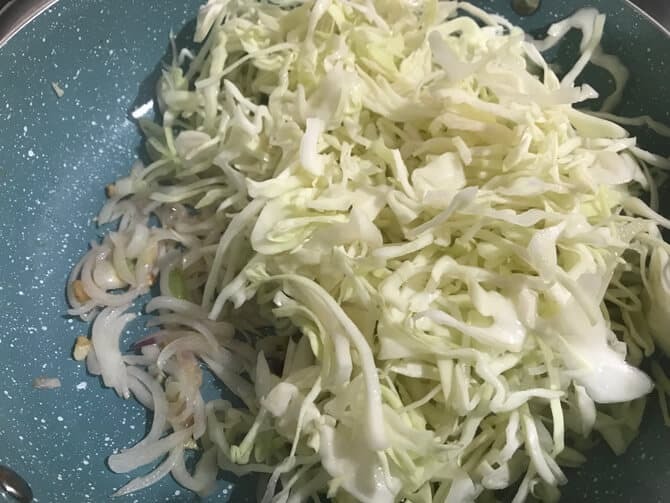 To list the ingredients for veg spring roll recipe, we have to use cabbage, in a shred form. 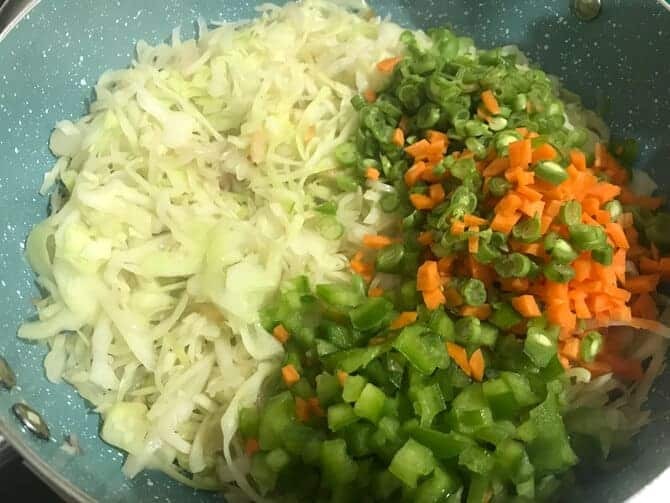 The other veggies that goes in, are chopped or sliced carrots, chopped beans, sliced or chopped capsicum, garlic, spring onions and onions. Furthermore, if you wish you can chopped mushrooms, corns, bell peppers and so on. 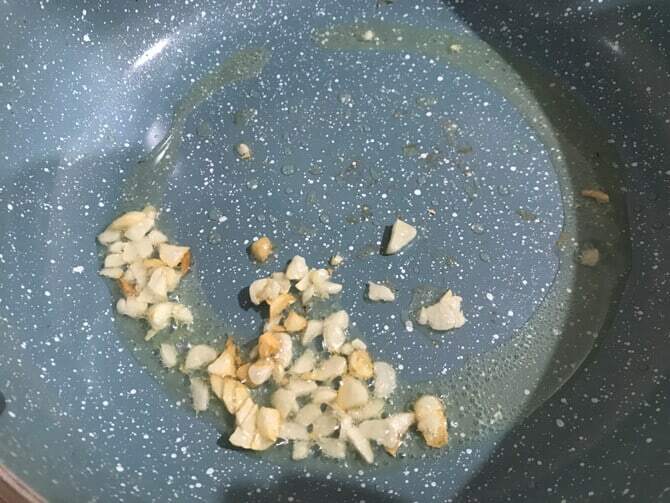 Also, if you wish you can skip garlic too, but i would recommend to use it. Indeed, the possibilities are endless you see, :). The sauces that goes in are only red chili sauce and soy sauce. However, you can swap red chili sauce with green chili sauce or just skip it. But, I like it’s spicy punch so, I do add it every time 🙂 You may also add chopped green chilies, if you wish to. 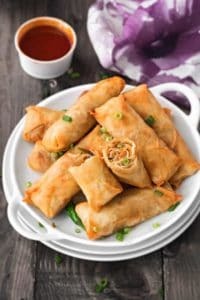 Are these Spring Rolls vegan? Yes, these are vegan spring rolls, as all the ingredients qualifies the vegan list. 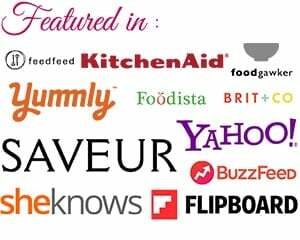 How to do baked Spring rolls? We can indeed bake the vegetable spring rolls. To make baked spring rolls, place them onto a tray and bake them in a pre-heated oven at 200 degrees for 20-25 minutes. Just, spray or brush the spring rolls with some oil and then proceed. 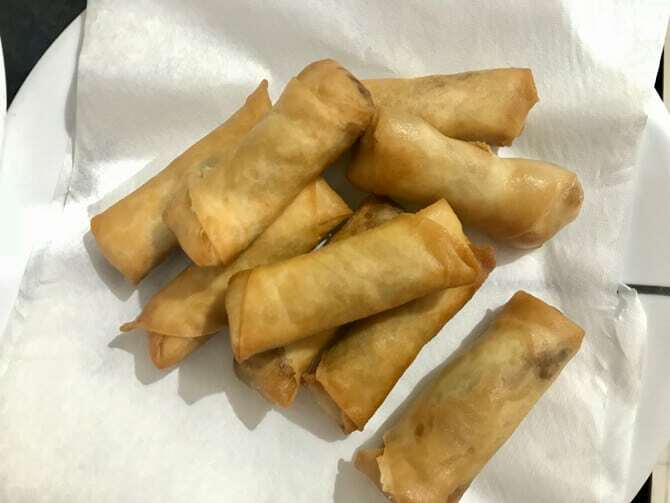 Can we use air fryer to fry the Vegetable spring rolls? 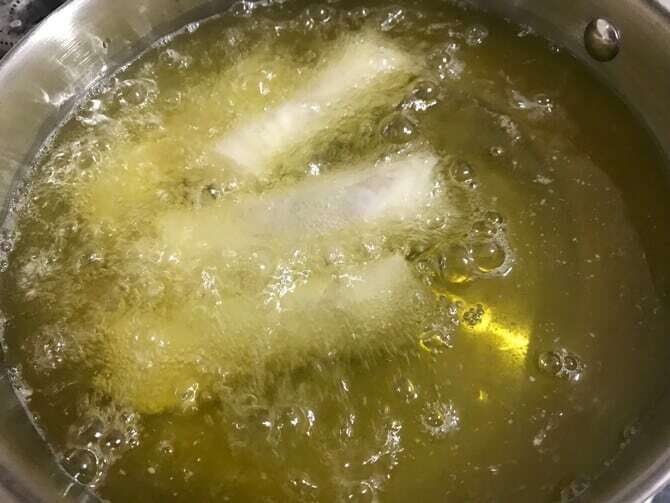 Yes, we can air fry the veg spring rolls in a pre-heated fryer at 200 degrees centigrade for 5-6 minutes. Of course, we need to brush the rolls with some oil here as well. And as a result, you have air fried spring rolls ready in minutes. How to store the Spring rolls in a freezer? 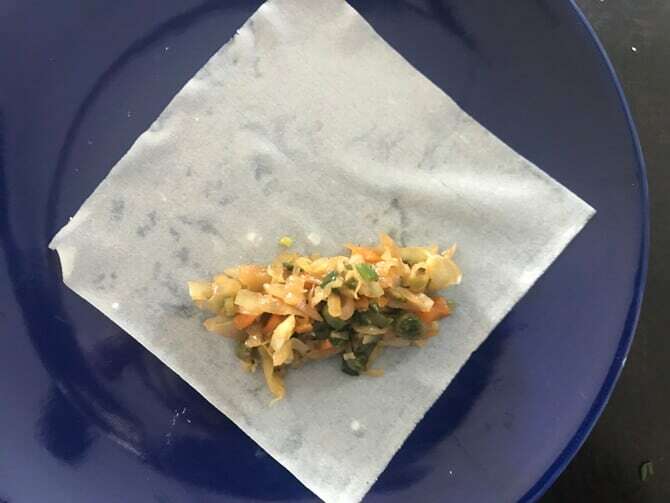 To freeze the vegetable spring rolls, all you need to do is, place the prepared rolls on the a tray or a plate and freeze it for 2 hours such that they do not stick to each other. Then, transfer it to a zip lock bag and freeze it easily for up to a 4 months. Before frying them, just keep it on the counter for 5-7 minutes and then fry it as and when needed. 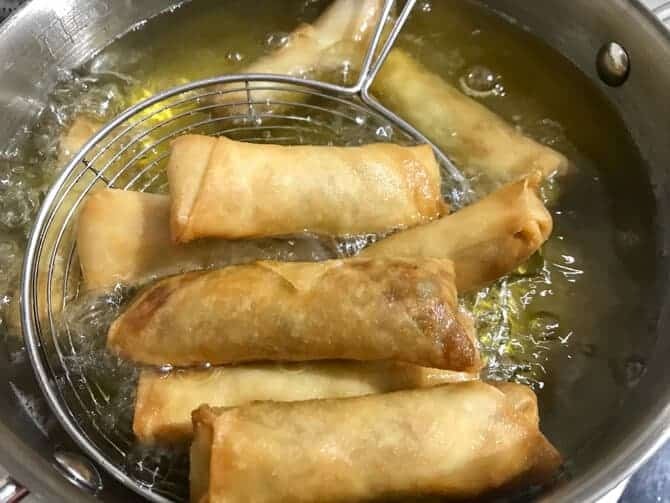 Always be sure to heat the oil well before frying the rolls, also, do not fry the spring rolls on very low heat as it absorbs excess oil when fried on low heat. So, once the oil is hot enough, then reduce the flame to medium and fry them on medium heat until golden and crisp. If you want to make spicy spring rolls, then add some green chilies or increase the amount of sauces as per your liking. You can use serrano peppers also, if you want to. Chinese spring rolls is a popular snack with crisp outer and spicy veggies filling within. These vegetable spring rolls are served in all the Indo Chinese restaurants across India. They are vegan and absolutely easy to make. Here is how to make spring rolls at home. 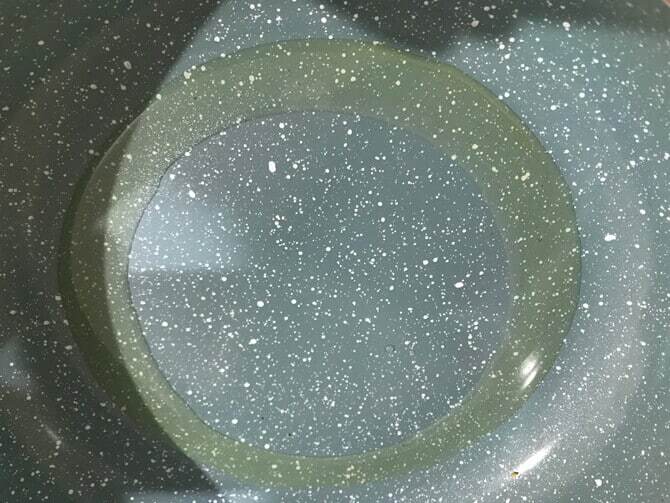 5 tbsp Corn flour mixed with 4 tbsp of water to form a slurry. 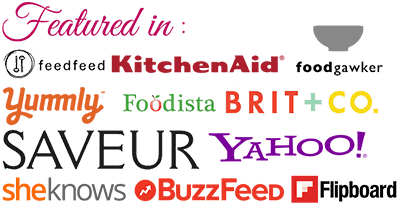 In a pan, heat refined oil. Then, add carrots, capsicum and beans and fry on high for 2 minutes. Lastly, add spring onion greens and sesame oil. toss on high for another 30 secinds. Please be sure to keep the mixture dry. Take it off the heat and cool. Place the spoonful stuffing at the one end as shown below. Take them off and place it on to a absorbent towel. Crisp spring rolls are ready to serve. 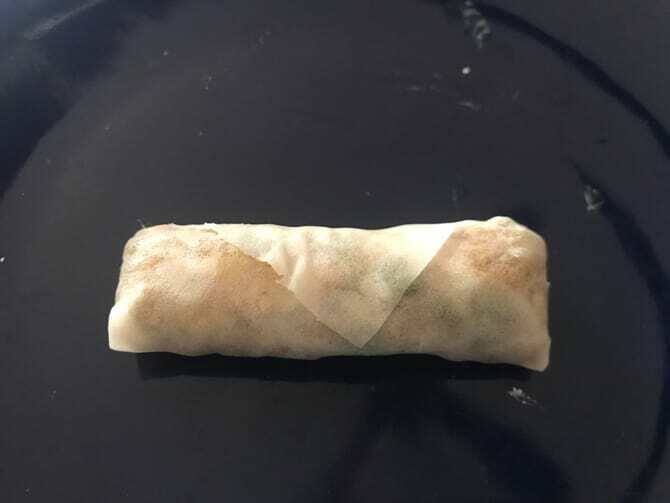 At any point, please do not keep wrappers or spring roll exposed to air as it will make them dry. Keep them covered throughout until fried. These Spring rolls can be frozen easily for good 3 months. You can noodles to make it as a noodles spring roll recipe. These spring roll can be deep fried as well as air fried. If you want to make spicy spring rolls, then add some green chillies or increase the amount of sauces as per your liking. You can use serrano peppers also, if you want to. 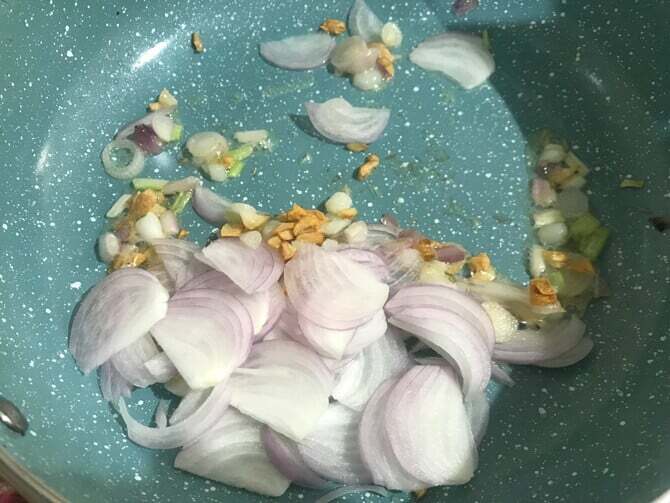 to begin with, in a pan, heat refined oil in a wok or kadhai. 5. Then, add carrots, capsicum and beans and stir fry on high for 2 minutes. 8. Lastly, add spring onions and sesame oil. toss on high for another 30 seconds. Please be sure to keep the mixture dry. Take it off the heat and cool. 10. Then, place the spoonful stuffing at the one end as shown below. 14. Again, apply the slurry on the edges and seal the rolls. Be sure to keep the rolls covered throughout to prevent drying. 17. Take them off and place it on to a paper towel. Vegetable spring rolls are ready to serve.